Share the bounty of your citrus fruit trees with those in need in our shared community. 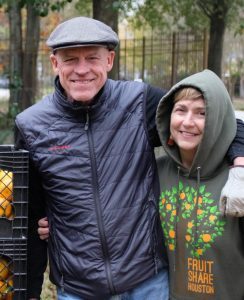 Fruit Share Houston was started in 2013 by Kent Keith and Karen Gordon after learning about Seattle’s Solid Ground Community Fruit Tree Harvest project. Using their how-to guide, Kent and Karen gathered their friends and launched their first successful fruit picking season. Helped by local newspaper stories, word spread, and new fruit tree donors and volunteers give of their extra fruit and time to make sure local food pantries can offer healthy citrus to those that need it. How does Fruit Share work? Fruitshare realizes that homeowners often can’t keep up with the surplus of fruit produced by their fruit trees. Instead of letting good fruit go to waste, our team of volunteers mobilize and pick it up. Fruit that would have been thrown out can now go to food banks, shelters, and community kitchens. How can I share my fruit? Fill out the form on “Share your tree”, and a member of our team will reach out to you to plan a fruit pick-up day. If I don’t have a fruit tree to share, how can I help? We are always looking for volunteers to pick up fruit! Please go to “volunteer page” and fill out the form to register as a volunteer. When do you pick fruit? We typically harvest from November through March. If you fill out a volunteer or fruit tree form while we are on hiatus, it may take a little while for us to respond. Your patience is appreciated!